‘The Gamblers’ is an immersive work that aims to take audience members on a Dantesque journey across the threshold of borders — political as well as geopolitical — into a world beneath the surface of the earth and across the landscape of postindustrial labor in the ruins of South Africa’s gold mines. 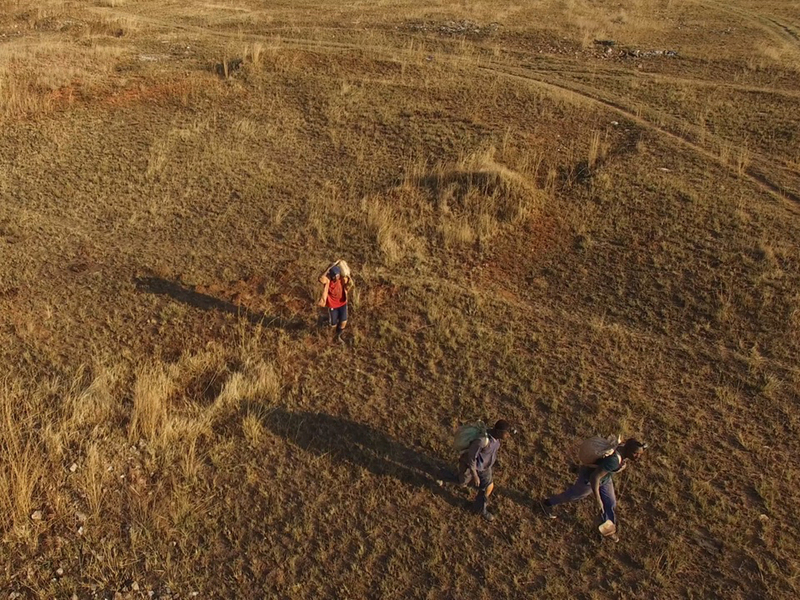 Made on location and in collaboration with South African cinematographer Ebrahim Hajee and southern African migrant miners Bhekani Mumpande, Prosper Ncube, and Darren Munenge, ‘The Gamblers’ is part of a series of related works, which include the feature-length documentary ‘We are Zama Zama’, produced and directed by Rosalind Morris. This multi-screen work and live edit of high resolution video and 16 mm film, will be followed by a conversation between the work’s director, Rosalind Morris, its video editor and 16 mm film artist, Philippe Leonard, as well as Yolanda Ariadne Collins and Astrid Deuber-Mankowsky. Rosalind Morris is Professor of Anthropology at Columbia University and Andrew W. Mellon Fellow in the Humanities. Her work addresses questions of the relationships between value and violence; aesthetics and the political; the sexualisation of power and desire; and the history of anthropological thought and social theory. Her books include The Returns of Fetishism: Charles de Brosses’s The Worship of Fetish Gods and its Legacies, with Daniel Leonard (Chicago 2017); Accounts and Drawings from Underground: East Rand Proprietary Mines, 1906, with William Kentridge (Chicago and Kolkata 2014); That Which is Not Drawn: William Kentridge in Conversation with Rosalind Morris (Chicago and Kolkata 2013). She is currently fellow at the American Academy in Berlin. Philippe Leonard lives and works in Montreal. His artistic practice focuses on still and moving images, through film, photography, performance, and installations. His theoretical and aesthetic reflections focus on the complex temporality of still and moving images, the spectral dimension of physical spaces, and expanded documentary practices. He completed a Bachelor’s degree in Film Production at the Mel Hoppenheim School of Cinema and a Master of Fine Arts at Concordia University. In 2013, he was awarded a residency at the MIT Media Lab to study under the mentorship of the late Harun Farocki. Y. Ariadne Collins holds a doctorate in Environmental Sciences and Policy, a Master’s in Research in International Environmental Policy and Politics and a Bachelor’s degree in International Relations from the University of Guyana. She was a Visiting Researcher at Wageningen University before joining the 2018-2020 cohort of research fellows at ICI Berlin. Her research interests include climate change governance and environmental policy and politics, especially in relation to the historical and cultural uses of forests in the Guianas. More specifically, she conducts research on neoliberalism and development through an analysis of market-based conservation and post-colonial development. Astrid Deuber-Mankowsky is Professor of Media Studies and Gender Studies at the Ruhr-Universität Bochum. She was a visiting scholar at UC Berkeley (2007), visiting professor at the Centre d’études du vivant, Université Paris VII – Diderot (2010), senior fellow at the IKKM (2013), and Max Kade Professor at Columbia University (2012 and 2017). She is also an Associate Member of the ICI Berlin and an external affiliate of the Centre for Philosophy and Critical Thought at Goldsmiths, University of London. Her research focuses on topics in critical, feminist and queer theory, media philosophy and epistemology, temporality and media aesthetics, media anthropology and theories of play, as well as Jewish philosophy.